Tiramisu has long been one of my husband Brad's favorite desserts. His favorite is green tea tiramisu (Geisha, my favoirite sushi place in NYC, has the best one), which I will have to try making soon for this site. 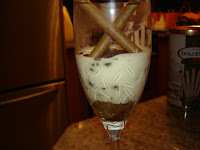 However, for our New Years Eve dinner, I made eggnog tiramisu trifles, which I served in white wine glasses. In my opinion they didn't taste too eggnog-like at all, which is probably a good thing. They did have a bit of flavor of each of the various types of alcohol used in preparing the dessert and were gone pretty quickly in our house (always a good sign). I based the recipe on a recipe from a 2003 issue of Bon Appetit Magazine that I found online, but cut the recipe in half because I didn't need 16 desserts that the recipe called for. I wound up making seven in the end. This recipe was a bit complicated, but well worth the effort. My initial plan was to use some edible gold powder to make it sparkle as a New Years Eve treat, but unfortunately I did not have a chance to pick up the edible gold in time for 2010. Perhaps next year. First, I whisked the 2/3 cup of sugar, 1/8 cup of water, rum, brandy, egg yolks and nutmeg in a metal bowl. Then I whisked in a double boiler for about four minutes until the mixture thickened. Then I whisked in the two containers of mascarpone cheese until it was fully combined into a custard. In my lovely mint green mixer, I whisked together the whipping cream and vanilla until the cream formed peaks and then added to the mascarpone mixture. This mixture is the first component of the trifle. Next, I brought 1/2 cup of water to boil in a saucepan. I added 2 T of sugar and the coffee powder. Then I used this mixture to coat the ladyfingers. Warning - this must be done quickly on both sides or the cookies will dissolve. Then, I layered the trifles in the wine glasses with the tiramisu mixture and the cookies (although the layers are not that distinct in the final product). I sprinked some ground chocolate on the top, and then rediidgerated for about 10 hours until the desserts were firm. This may not be the most stunning looking desert in the world (unless you take my suggestion and get some gold powder) but it was quite good tasting and a perfect dessert for New Years Eve - certainly a good way to start out a new decade. I garnished the dessert with some tiramisu cookies that my mom sent to us with our Hanukkah gifts. We had some wonderful Chicken Marsala for dinner tonight - a classic in our kitchen. Either my husband or I will post that one soon, so stay tuned.